The LEGO Ninjago Movie is a hyper visual adventure loaded with humor and warmth. Kids will be dazzled by the frenetic animation, while enjoying a lot of laughs with the adults. I walked into this film cold. Beyond a fleeting glimpse of the trailer, I didn't have a clue about anything Ninjago related. Kudos to the directing and writing team for crafting a film enjoyable to all audiences. They successfully introduce the characters and setting before veering off into the crazy plot. Lego and Warner Bros. are officially on a streak. Their third collaboration doesn't surpass Lego Batman, but is a damn good effort. The story takes place on the bustling island of Ninjago, where Lloyd (Dave Franco) is having a terrible sixteenth birthday. Everyone on Ninjago hates his guts. Why? Because Lloyd is the son of the evil Lord Garmadon (Justin Theroux), a maniacal, four-armed despot hell bent on conquering Ninjago. Garmadon abandoned Lloyd at birth and has made no attempt to contact him. Instead, he and his army routinely attack Ninjago, destroying the city and making life miserable for everyone. 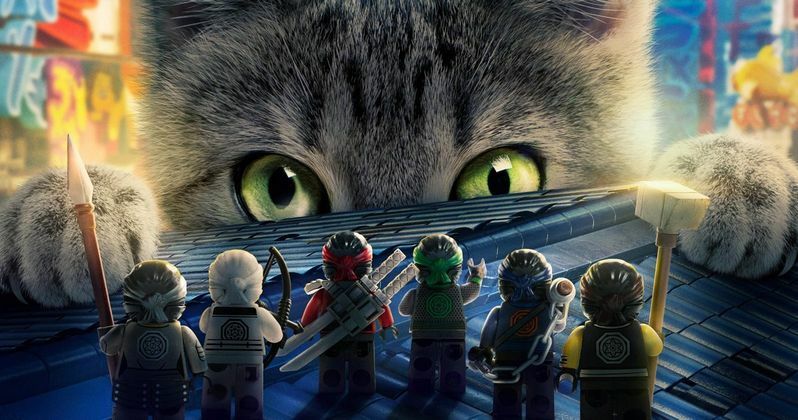 Thankfully, Ninjago has the Secret Ninja Force and their mech fighters to repel Garmadon's forces. Lloyd's problem is his secret identity as the Green Ninja, leader of the Secret Ninja Force. He and his five high school buddies were trained by his uncle, Master Wu (Jackie Chan), Garmadon's brother. So while the public reveres the Green Ninja's heroics, they despise Lloyd because of his father. Equally frustrating for Lloyd is fighting Garmadon as the Green Ninja, when he really just wants a positive relationship with his dad. The family conflict comes to a head when Lloyd decides to use Master Wu's Ultimate Weapon on his absentee, clueless warlord of a father. The Lego Ninjago Movie is essentially about a father and son reconnecting. The fact that they're secretly bitter enemies is just one of the many obstacles they have to overcome. Justin Theroux's Garmadon is a vain, ego driven narcissist. His ineptitude as a conqueror equals his parenting skills. He can't even pronounce Lloyd's name. Their relationship is hysterical. The laughs get bigger as Lloyd's ninja pals join the getting to know Garmadon fracas. The key here is that the filmmakers nailed the switch from funny to sincere. It's not all giggles as Garmadon realizes that parenting is an actual thing. Coming from Warner Bros., the visual effects, much like Lego Batman, are nonstop and intense. Every part of the screen is wickedly busy during the chaotic fight scenes. This tames a bit in the second act, but is full, frenzied speed ahead in the beginning and climax. I understand this is state of the art 3D animation. It looks wonderful, but can be overwhelming to the eyes. Lego puts a lot of attention on accentuating small parts. All respect is due to the animators for the focus on detail, but sometimes less is more. I believe they can take a stylistic page from companies like Laika (Coraline, Kubo and the Two Strings). The Lego Ninjago Movie is completely devoid of risque elements. There are no double entendres or nod and winks to more adult material. The film is age appropriate for the toy group. It is short, funny, and just sweet enough to not be syrupy. Praise again to the filmmakers for making The Lego Ninjago Movie understandable to grown ups. I am still laughing at the Ultimate Weapon. Dare I say genius. Avengers: Endgame Toy Leak Reveals One Way to Defeat Thanos?